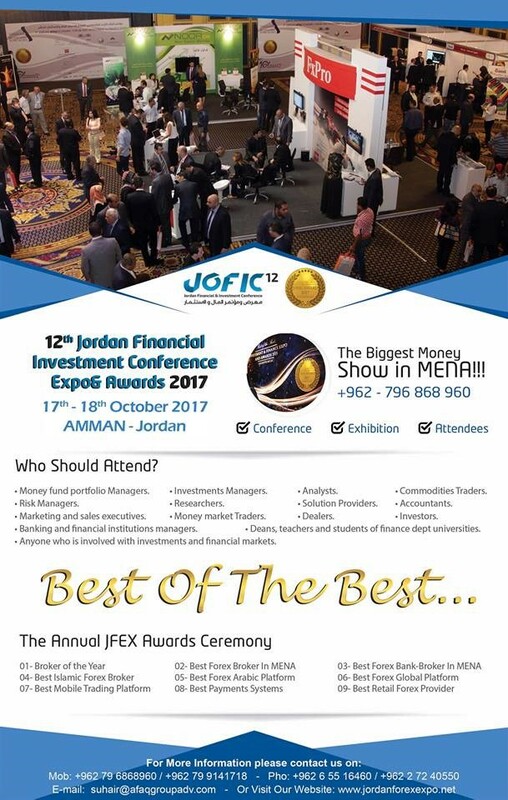 The 12th Jordan Financial Investment Conference (JOFIC) Expo & Awards 2017 will be held on October 17-18, 2017 in Amman, Jordan, under the subject “Problems in the FX Industry are big and hard to fight”. Following the success of the previous years, the Forum will examine in detail how to practice and learn about the industry. JOFIC 2017, which is organized by AFAQ Group, has grown considerably due to the increased demand for Financial Knowledge and the growing number of international companies entering the market. Invited to attend are financial executives, from Money Fund Portfolio Managers and Risk Managers to Money Market and Commodities Traders, Analysts, Accountants, Investors, teachers and students of finance.